Bradford is known not only for its artistic excellence and blessed with a significant cultural, architectural and literary heritage, but the Yorkshire city also boasts an impressive history. The city’s original name ‘Broadford’ referred to a crossing point – originally a ford of a large stream – near the site of Bradford Cathedral, around which a settlement was established during Saxon times. The Domesday Book in 1086 records ‘Bradeford’ as a village of around 300-350 people. Records show that Medieval Bradford was centred around only three streets, all of which still exist today – Kirkgate, Westgate and Ivegate, deriving the ‘gate’ from the old Danish word ‘gata’ meaning street. Bradford’s prosperity rose from its woollen industry which relied on the area’s significant local resources of water, coal and iron, propelling it to become an international centre of textile manufacture. The city’s industrial past continues to dominate its landscape, evoking the days when it was nicknamed ‘Worstedopolis’ for making ‘worsted’, a fine wool fabric used in top quality clothing. As Bradford went on to emerge as one of the greatest manufacturing cities of the Victorian Empire, the best architects and builders were engaged for new commercial buildings to reflect its rapid expansion. Many of Bradford’s most striking buildings date from this era, highlighting to this day the highest standards of Victorian design and sculptural ornamentation. The Wool Exchange, completed in 1867, symbolises the great wealth and importance which Bradford had gained from the wool trade by the mid-19th century. Ornate ‘Venetian Gothic’ in style with very decorative roof parapets and pinnacles, the foundation stone was laid by the then Prime Minister, Lord Palmerston. 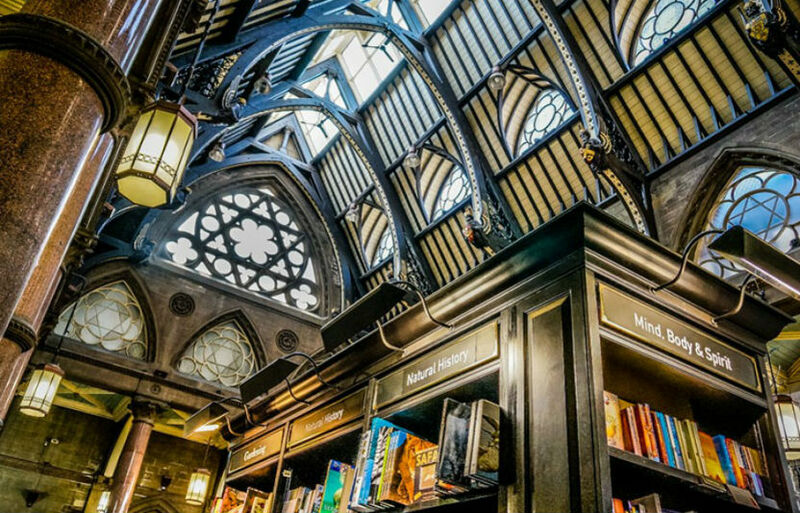 The Wool Exchange is today home to arguably the most beautiful bookshop in Britain, Waterstones, who are book partners of the Bradford Literature Festival. The Bradford District is home to Bronte Parsonage, where the country’s most eminent literary siblings used masculine pen names to write their famous classics of English literature: Jane Eyre (Charlotte Bronte, 1818-1855), Wuthering Heights (Emily Bronte, 1818-1848) and The Tenant of Wildfell Hall (Anne Bronte, 1820-1849). The sisters’ former home, set amid the breath taking moorland immortalised in Wuthering Heights, is beautifully preserved by the Bronte Society, one of the oldest literary societies in the world. Bradford novelist, broadcaster and master playwright, J B Priestley (1894-1984), also used his Yorkshire background in some of his finest works, such as When We Are Married and Bright Day. The J B Priestley Archive, now held at the University of Bradford, features not only his plays, personal correspondence and collection of photographs, but also his iconic pipes!